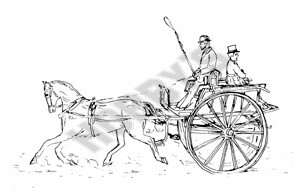 A high two wheeled vehicle of dog-cart shape, with panelled sides, used for tandem driving. With the tailboard down, two extra passengers facing backwards can be accommodated. Also available in 1/12th scale JT42B.